To use Zip Exporter you need to export some images. Go to the Library mode, select the images that you wish to include in the Zip file and then press the Export button. Choose Zip Exporter from the top of the dialog box (under Lightroom 2 click the two arrows at the top right of the dialog). Choose the destination folder and file name for the Zip file. Optionally, you may choose to encrypt the contents of the file using a password, in which case the password will be required in order to extract the file from the Zip archive (the unzipping software should handle this). 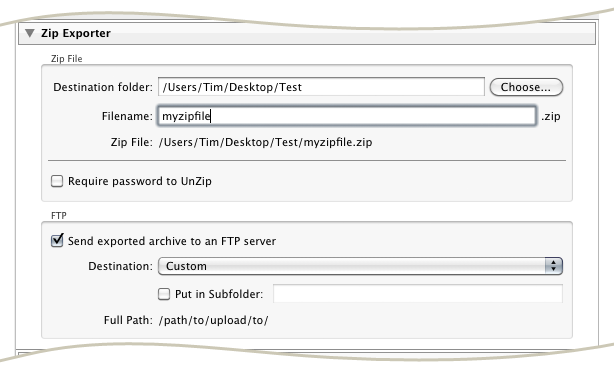 If you wish to send the Zip file to an FTP server then you should tick this option and choose the server to send to. The rest of the dialog includes the standard export settings, such as those for filenames, images sizes, etc. When you're ready, press 'Export'.